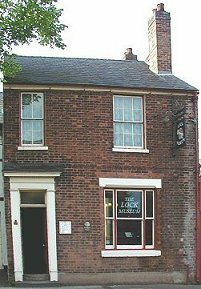 The Locksmith's House, the lock museum in Willenhall, was rescued, in a sad state by the Black Country Living Museum in 2003. Since that time a lot of work and effort has gone into the building and its displays. The Locksmith's House is open again, but only to pre-booked groups. The minimum charge for a group consisting of 1 to 15 people is £75.00. The charge for a larger group is £5.00 per head. If you would like to arrange a visit, please telephone the Black Country Living Museum's booking office on 0121 520 8054.